World War I Veteran and OH Gamma Brother Captain Robert Lester Tavenner, U.S. Army completed his service in Europe with the American Expeditionary Force on this date. DE Alpha Brother S. Clifford Dunn entered the Army and began his 45 months of World War II service. World War II Veteran and DC Alpha Brother Staff Sergeant Logan P. Crossland, U.S. Army Air Force was discharged from the Army on this date after nearly 42 months of service. On this date, Korean War Veteran and Fighter Ace, IN Alpha Brother Captain Iven Carl "Kinch" Kincheloe, Jr., U.S. Air Force piloted the Bell X-2 research rocket plane to a speed greater than 2,000mph and to a world's record altitude of 126,200 feet – the first flight ever above 100,000 feet. For this he was nicknamed "America's No. 1 Spaceman" and received the Mackay Trophy the next year. In 1987, the SigEp Citation was posthumously awarded to Brother Kincheloe. World War I Veteran, Governor (Iowa), U.S. Senator (Iowa) and IA Beta Founding Father Second Lieutenant Bourke Blakemore Hickenlooper, U.S. Army died on this date while visiting friends in Shelter Island, New York. In May 1917, Bourke left school to attend the officers’ training camp at Fort Snelling, MN, and was subsequently commissioned a second lieutenant and assigned to France as a battalion orientation officer. After his military service, he returned to the U.S. in early 1919, and in June received his bachelor’s degree from Iowa State. Born in 1896 in Blockton, IA. 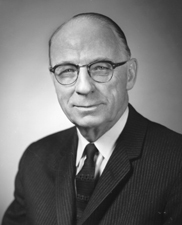 Brother Hickenlooper obtained his law degree from the University of Iowa College of Law, and was a practicing attorney in Cedar Rapids until being elected to the Iowa House of Representatives in 1934. This began his commitment to public service. World War II, Korean War and Vietnam War Veteran, PA Mu Brother Brigadier General William Robert Sarber, Jr., U.S. Army (Retired) died on this date in a nursing home in Yorktown, Virginia. Born in Charleston, WV in 1929, William graduated from Temple University with a bachelor's degree in Accounting, and began his 31-year military career in 1946. Brother Sarber's commands included the 7th Transportation Group, Fort Eustis, VA; Kaiserslautern Army Depot Complex, U.S. Army, Europe, and Eastern Area, Military Traffic Management Command, Bayonne, NJ. Respect can be paid to Brother Sarber at Arlington National Cemetery, Arlington, VA.
U.S. Navy World War II Veteran CO Alpha Brother Donn Beck Brown died peacefully on this date. WWII brought Donn to California. He served in the United States Navy in underwater demolition, which was the precursor to the Navy Seals. After his military service, Brother Brown began his career with A.J. Bayer, Co. in Los Angeles, eventually becoming President and Chairman of the company. He was born in 1916, in Dayton, Ohio, and attended the University of Colorado where he earned his mechanical engineering degree. He served on the Board of Directors of many organizations, including the Boy Scouts of America, the Salvation Army, Florence Crittenton Center, Hollywood Presbyterian Hospital, First Lincoln Financial Corp. and Union Bank. On this date, VT Alpha Brother Lieutenant Colonel Edmund Lewis Koehler, U.S. Army / Army Reserve / Army National Guard (New Jersey & Vermont) (Retired) died in Shelburne, Vermont at the age of 74. Born in Morristown in 1932, he was a graduate of Boonton High School and Norwich University, where he received his bachelor's degree in business administration. While at Norwich, Brother Koehler was a member of the Hockey and Track teams, French Club, Junior Weekend Committee, Outing Club, War Whoop Staff, and Alpha Kappa Psi. After his commissioning and graduation from Norwich, Ed served in the Army 2nd Armored Division in Germany and Austria. Lieutenant Colonel Koehler completed his Army Reserve career following tours in the New Jersey and Vermont national guards. His business career began in New Jersey with Standard Oil and continued with Coin Depot Corp. In 1968 he relocated to Vermont and worked with Green Mountain Hardware, and he retired from Brite Technologies in 1997. World War II Veteran and NY Beta Brother Major Oliver John Foster, Jr., U.S. Army Air Forces died peacefully on this date at the Vermont Veterans Home in Bennington, Vermont died at the age of 86. During WWII, Brother Foster served as a P-47 pilot and a Captain in the 311th Fighter Squadron of the 58th Fighter Group in the South Pacific theatre. He was a recipient of the Distinguished Flying Cross, and the Air Medal with three Oak Leaf Clusters. Upon his return stateside, he received a promotion to Major. Oliver studied architecture at Cornell University and practiced in Sweden before returning to the U.S. to pursue his career in West Hartford, CT where he was a partner in the firm of Moore and Salsbury, Architects. The balance of his career was spent in private practice in Maine and Prince Edward Island, Canada. Respect can be paid to Brother Foster at Section E-50, Site A in the Vermont Veterans Memorial Cemetery, Montpelier, VT.
U.S. Navy World War II Veteran NY Beta Brother John William Bacon, 82, died on this date in Soquel, California. At 18, John joined the Navy and after his service, he attended Cornell University graduating with a BS in industrial relations. In 1951, Brother Bacon moved to Washington, DC to work for BNA Publishing Company and attend law school at George Washington University. In 1957, he took a job with the Food Employer's Council (FEC) and moved to Los Angeles. He finished his career as President of the FEC. Active in his community, Brother Bacon was involved with charities and organizations including the United Way and the Seymour Center/ Long's Marine Lab in Santa Cruz. On this date, on the 65th anniversary of the mission he commanded flying the official photos of the Japanese surrender back to Washington, DC, World War II and Vietnam War Veteran, and UT Alpha Brother Lieutenant Colonel William J. Gibson, U.S. Air Force (Retired) died at his home in Air Force Village, San Antonio, Texas. He entered active duty with the Army Air Corps in October 1941 as a B-17 pilot. Immediately after the attack on Pearl Harbor, he deployed to the Pacific Theater, where he flew numerous combat missions against enemy shipping and ground targets. At age 24 he was the youngest Lieutenant Colonel in the Army Air Corps, commanding a squadron of B-29s. In the last mission of the war, he led a composite crew drawn from all the air crews in the Pacific Theater to fly the official photos of the Japanese surrender back to Washington, DC. Brother Gibson also served in Vietnam, completing more than 1,000 combat missions. He was rated in 62 different aircraft from bi-planes to jets, with more than 22,000 flying hours. He was a member of the Quiet Birdmen and the Order of Daedalians. He volunteered for many years as a docent at the Institute of Texas Cultures, and served the Air Force Association as a National Director and a trustee of the Aerospace Education Foundation. Brother Gibson was devoted to his fellow veterans of the 505th Bomb Group, who met regularly for reunions under his direction. Respect can be paid to Brother Gibson at Ben Lomond Cemetery, North Ogden, Utah. On this date, Vietnam War Veteran and ID Alpha Brother First Lieutenant James Walter Swan, U.S. Army, 66, died in his cabin in McCall, Idaho with his family by his side. After he graduated from Idaho State University with a degree in Business Administration and Marketing, he joined the U.S. Army and served as a First Lieutenant in Texas and then in Korea on the DMZ. Brother Swan was laid to rest with military honors at the Idaho State Veterans Cemetery in Boise, and respect can be paid to him there in Section 10, Row P, Site 128. * U.S. Navy World War II Veteran and OR Alpha Brother Lieutenant Commander John Franklin Lorence, U.S. Navy Reserve (Retired) passed away on 25 AUG. He left high school at the end of his junior year at age 17 to join the U.S. Navy, and arrived at boot camp on D-Day. A Celebration of Life will be 14 SEP at 2:00 pm at the Restlawn Memory Gardens Chapel, Salem, OR. * U.S. Navy Veteran and PA Eta Brother Roland Andrew “Rollie” Shaffer, Jr. passed away 28 AUG after a lengthy illness. We believe Rollie was a Korean War Veteran, and would appreciate anything that will confirm this and allow us to give Brother Shaffer the proper respect. * Vietnam War Veteran and SC Alpha Brother Lieutenant Colonel Michael G. Healey, U.S. Army (Retired) passed way 29 AUG in Williamsburg, Virginia. He served with distinction and valor with the 11th Armored Cavalry Regiment in the Republic of Vietnam, where he earned a Purple Heart, and four Bronze Stars, including one with Valor. * U.S. Army Air Corps Veteran TX Alpha Brother Marvin Loyd “Bo” McLaughlin passed away 30 AUG in Tyler, Texas. Our thoughts and prayers go out to the family, friends and chapter brothers of SigEp Patriots Lorence, Shaffer, Healey, and McLaughlin. While they are no longer with us, the greatest casualty is being forgotten, and the SigEp Patriots Project (SPP) pledges these Brothers will always be remembered. * Promotions! On 30 AUG, a ceremony was held on Randolph AFB to promote U.S. Navy and U.S. Army Veteran, TX Delta Brother Felix Islas to his current rank of Major, U.S. Air Force. Recently, Operation ENDURING FREEDOM Veteran and VA Pi Brother Patrick Bryant was promoted to Lieutenant, U.S. Navy! Best of luck in your new leadership roles. * Wedding bells continue to ring. This weekend, Operation IRAQI FREEDOM Veteran and CA Eta Brother Captain Dave Bradt, U.S. Marine Corps got married. Congrats to Courtney and Dave! * OK Alpha Brother First Lieutenant Grant Milbourn, U.S. Air Force became a qualified Air-to-Air Refueling pilot on 04 SEP. Congratulations Grant! * On 06 SEP, the U.S. Navy's newest "Doc" – VA Xi Brother Hospital Corpsman Seaman Henri Noordanus – graduated from Hospital Corpsman "A" School. * Welcome Home! On Saturday, Operation ENDURING FREEDOM Veteran and NY Chi Brother Captain Adam Martin, U.S. Army reported he is back home among family and friends following his successful deployment to Afghanistan! * As of this writing, the archives of SPP now contain the names of more than 4,290 SigEp Patriots! * SPP’s official Facebook group – SigEps Who Serve – now numbers over 615 such Brothers. * NH Alpha Brother Private First Class Charles Enos Tayntor, Jr. was incorrectly listed as Charles Enos Tayntor. * As we enthusiastically welcomed home LA Alpha Brother Major Robert “Brian” Taylor, U.S. Army we misstated the record of his wartime service. Brother Taylor is a two-time veteran of Operation IRAQI FREEDOM, and a veteran of Operation ENDURING FREEDOM following his service in Afghanistan.